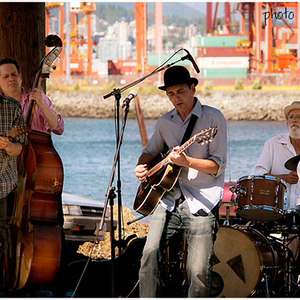 Sunday, July 31, 2016 - The Circus In Flames bring their "garage string band music of the Canadian south" to the City of Port Coquitlam's Music in the Park series. The band featuring singer-songwriter Doug Andrew on archtop guitar, Brian Barr on mandolin and electric guitar, Phil Addington on bass, Brian Thalken on banjitar and Ed Goodine on drums will perform two sets of original music between 2 PM and 4 PM at the Leigh Square Bandstand located at 2253 Leigh Square Place in downtown PoCo right by City Hall. The show is presented by the City of Port Coquitlam Recreation Department and is absolutely free.